Last week I was involved in a discussion on a very hot topic in a group of more than 45 people and almost the same diversity of national cultures. About every individual in the room had a firm opinion on the topic and the debate was on: a lot of intelligent people making their point but getting nowhere. Why? Because there was a lot of talking and no listening. – as a not-speaker you are totally focused on the conversation thread. I have been told that the talking stick is part of the 8th Habit book of Stephen Covey. Shame on me for not having read it yet. 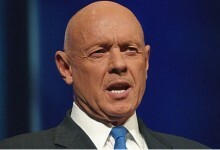 In the below movie you can see Stephen Covey explaining the talking stick and its success. Covey talked about how he learned of the Indian Talking Stick when working with Native American Tribes. These tribes used a talking stick to ensure that each party was able to express themselves and feel listened to. – We found out that one does not need to agree in order to receive the other person’s communication and to acknowledge understanding. – One extravert manager reported that ‘not being allowed to talk’ made her ‘listen instead of talk’ and she found out that ‘not talking’ was more productive to the conversation 5 times out of 6. Wow, this exercise was really a powerful experience and if I ever get the challenge of ‘too many people saying too many things’ I hope I remember it.